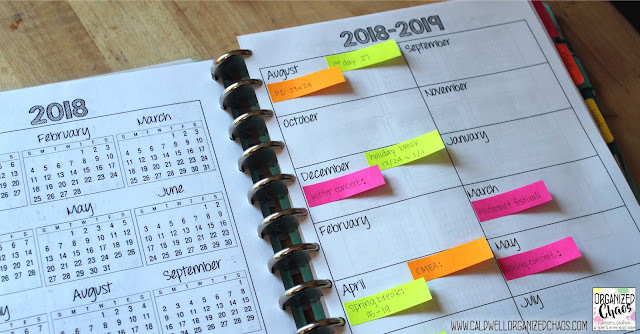 For those of us on a traditional U.S. school calendar, this is often the time of year when we start looking ahead to dates for next school year. And with all of the concerts, festivals, and springtime chaos to already keep track of for the current school year, it can get pretty confusing trying to keep track of all of those dates and plans! 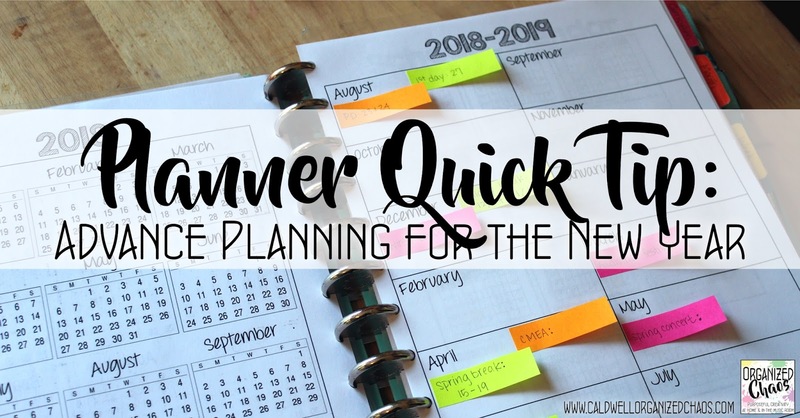 Today I have another "quick tip" for streamlining your planner: how to keep track of important dates and information for the new school year! 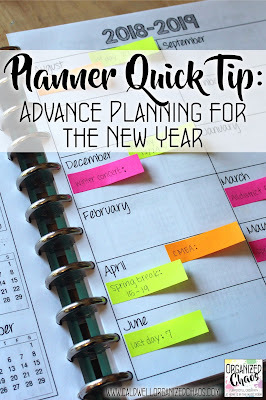 Sure, you could go ahead and get all of your weekly and/or monthly calendars printed out for the next year and start writing in your plans there, but I found when I did that I got completely overwhelmed by #allthecalendars and could not keep track of things very easily. 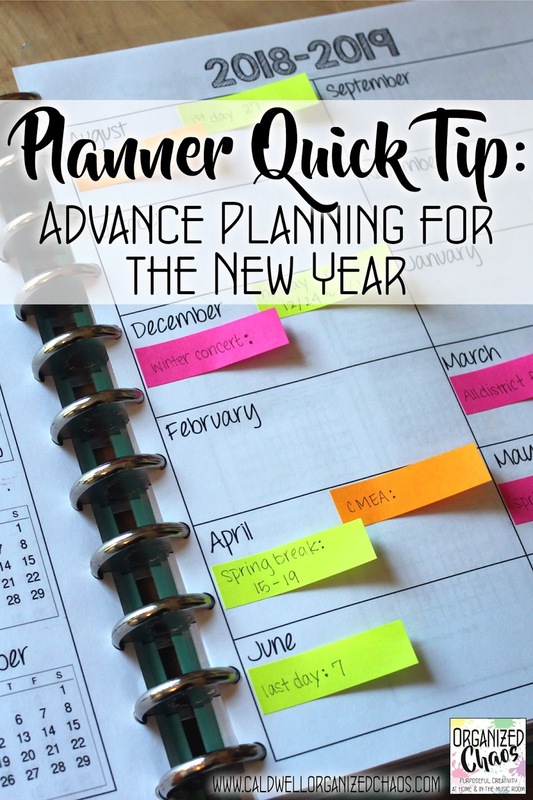 Whenever a new event or question would come up about the following school year, I found that I either didn't have those calendars with me because I didn't want to carry 2 year's worth of planners around, or it took me forever to find the information I needed because there were just. so. many. pages. My solution: print off a one-page overview for the new school year and stick it in the front of my current planner. I started doing this last year and have found it much easier to keep track of everything without getting overwhelmed. I already had these pages with monthly boxes to use for long-range curriculum planning, so I added the heading for the next school year at the top, printed it out, and stuck it in my current planner. Then I use sticky notes to add in important dates in the months that they fall, like extended breaks, school events, and potential concert dates. 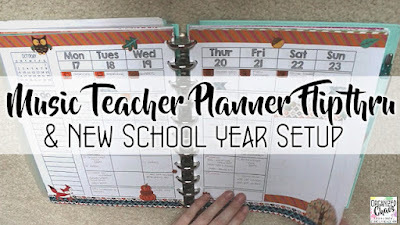 You can easily set up a page like this yourself to add to whatever planner you use, or you can find these in my printable planner sets with all different date ranges to accommodate different school year calendars. I usually keep this page right next to a printed copy of the new school year's district calendar so I can reference that if I need to. Want to stay in touch and get timely tips like this sent straight to your inbox? Click here to sign up for the Organized Chaos newsletter!